Last Friday, 27 May 2016, the Ararat Branch for the Victoria Policy Blue RibbonFoundation\‘s held its 15th Gala \’Night of Nights\’ at the Ararat Town Hall. It was great to be back in Ararat where I have conducted the Auction since 2002. 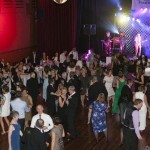 The night raised over $30,000 for the Jason Bond Perioperative Unit at East Grampians Health Service. With the locals eager to contribute to a fantastic cause.